This is still very much alpha software (totally unfinished). 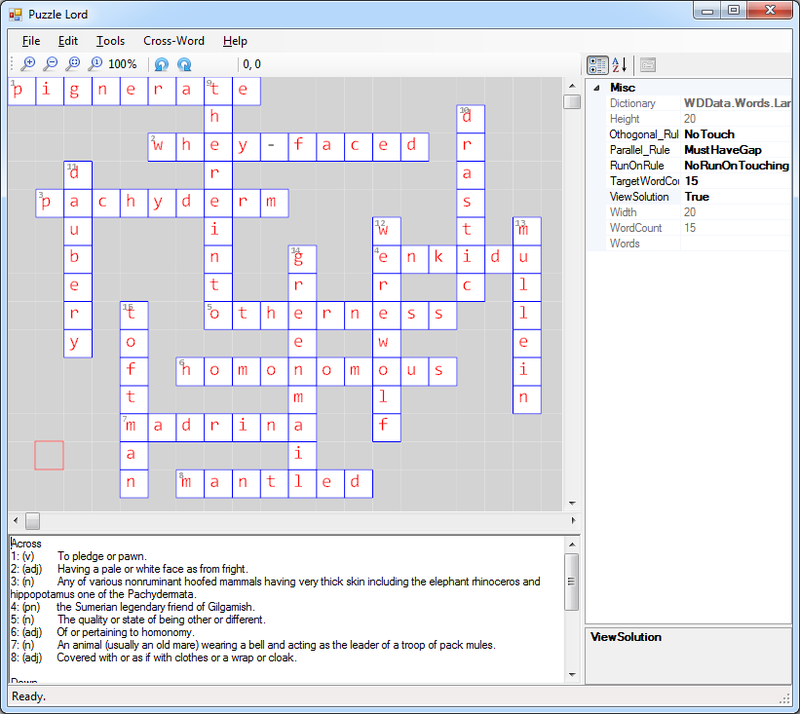 This crossword puzzle generator is provided here for those who would like to kick the tyres and get a preview of some upcoming software. Unimplemented menu items are greyed out..
No way to save a crossword yet. Generates a valid cross word, generally quickly, but may stall for 20 seconds during generation. Not a bug, my algorithm is not finished. If it works itself into a corner, it tries to think its way out instead of backing up a step. Zooming in moving etc (few minor bugs still). Mark squares that must/must not be used. Find word(s) for given spot. Restrict to words of a certain readership / usage frequency. Use one dictionary across a series of crosswords.